When 'Outlander' airs on Starz, you can feel the excitement buzz around the world. Back in your home, you can channel that greatness into a little party of your own. Whether it's just a few friends around for an 'Outlander' on Starz premier gathering, or a full blown 'Outlander' themed party, then there are goodies for you. Cakes, napkins, plates, mugs, candies... you name it, it's probably available. There are collections for those wanting it all to match, or you may mix and match between them. Take a look! ... or indeed any manner of Outlander themed party in your home. You'd be amazed at the number of Outlander party collections available for your clan gathering. From plain (but historically authentic) Fraser tartan through to phrases beloved to all Outlander fans, the set may be found. Moreover, there are elements to suit any pocket. You can mix and match, collect apiece or choose only one thing to include in your fabulous Outlander event. Like this lot, included in my thumbnail for this article. I'm a writer, not an artist, hence I haven't exactly arranged all of those items to scale. But you get the general idea of what's out there for your Outlander do. 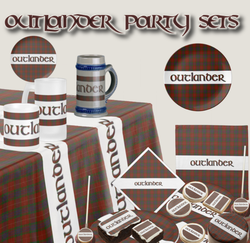 They are just a few of the thirty plus items from the popular Outlander Party Set 1. The gigantic Outlander shortbread to share (right) is another. Clicking there will take you to the whole collection. Plus it's shortbread - a perennial favorite from Jamie's native Scotland. If you're not feeling that flush, then smaller packs of shortbread are included for individuals to munch. Not to mention a whole buffet worth of brownies, cookies and candy. These may be served on Outlander paper plates (or porcelain, or melamine), with the crumbs dabbed away with any of a huge selection of Outlander napkins - paper or linen. Each one of these Outlander event sets have a core thirty products. There may be more to reward those with the will to hunt further. I'll only present one item from individual collections, but know that every product is available in all of the other designs highlighted here. Merely find your preferred artwork and, from the product it adorns, continue on into the wider set. For now, we'll begin where most parties do - with the alcohol and the Outlandish ways in which you and your guests might imbibe it. Outlander party glasses may hold any beverage of your choice - soda for the drivers - though the vessels depicted below are perfect for ale. You'll be hard pushed to know whether to display the Fraser Tartan Outlander stein as an ornament, or fill it with beer and shout slàinte mhòr* as you guzzle to a beat of the Skye Boat Song. It's available in two colors - the grey and blue depicted above or a fabulously classy white and gold. Personally, I think the latter is the loveliest, though each to their own here! I love the frosted beer mugs! Though they are vaunted for ale, they are equally able to hold hot beverages too. Party with your beer, then give it a wash and use it for your morning coffee too. It's fine in your dishwasher, if you want to nap for the interim. * Scottish Gaelic drinking toast, literally 'great health'. For Jamie Fraser and his contemporaries there would have been a dual meaning. The 'mhòr' (great) sounds awfully like 'mòr' (Marion), hence it could be 'Marion's health', aka Mother Mary. As the Jacobites were trying to reinstate the crown of Catholic James Stuart, then slàinte mhòr was a veiled declaration of rebel leanings. Or 'great health', if the English Redcoats were to overhear. And yes, you can use this toast over ale too. Slàinte has become more associated with whisky because frankly it's usually whisky that we're drinking. The set of four wine charms are there to provide a bit of bling for Outlander fan glasses. They wrap around the stem of wine glasses (or brandy glasses, and any other with a narrow base, i.e. no good whatsoever for whisky...). If you've mixed and matched with another wine charm collection for Outlander fans, then they may be used to tell drinks apart. Hence you don't have the situation that I was in last night, when my friend and I couldn't work out which was her Mississippi fire whiskey and which was my Irish Jameson. I had to sip them both. A hard job, but I took it for the team. That's the drinks sorted out. What about the Outlander crockery for food? I've begun here with plates which may be more appropriate for dinner parties than a less formal gathering of the clans. In fact, most people get them as gifts to hang on the wall rather than part of a proper luncheon set. Je Suis Prest Party Set 4 modelling a Melamine 10" plate. Non-toxic, dishwasher safe, break resistant, but you can't put it in the microwave. Frankly, for that price, it would be on my wall. Fraser Tartan Party Set upon a porcelain 8.5" diameter plate. This comes complete with little holes on the back to wall mount it more easily. Fraser Crest Party Set 3 porcelain 10.75" diameter plate. Same holes; food, microwave and dishwater safe, but ridiculously expensive. The kind of crockery you only break out if Sam Heughan Himself is coming to lunch. For most parties, we're probably looking at the paper varieties below. Je Suis Prest Paper Plate 7"
Do you see that Outlander party paper plate 4? You are looking at the most popular item in the whole of the collections amassed. Right now, that's what loads of your fellow fans are opting to have delivered to their homes. Personally, I would have thought designs like the Je Suis Prest one would have topped the charts, which just goes to prove that I have no taste. Or nobody else has found that one and its ilk yet. Obviously with the paper plates, you're not just getting one. They come in packs of eight apiece. Perfect for a small get together of Outlander friends there to watch the show over munchies and a wee dram. Where there are party plates and food, there's a need for Outlander napkins too! People tend to buy napkins and/or serviettes to match their plates, so the biggies here complement the shadow Outlander paper plate above. But I promised one item from every collection, and we've already had that one. Instead we have some favorite calming words (right) from the Laird of Lallybroch followed by three iterations of his clan motto - a couple of which also include the Fraser clan crest. Fundamentally, you are looking at two different kinds of paper napkins, each further divided into white or ecru. The diamond shaped ones (in this display anyway!) are both cocktail serviettes for Outlander fans, while the square Fraser crest varieties are Outlander luncheon serviettes. Fraser Crest party Set 2 on an ecru paper Outlander luncheon napkin. All very pretty - and arriving in quantities of fifty per pack - but still very disposable. There are going to be a lot of Starz Outlander premier parties, as the series pans out and every book gets dramatized. You might prefer napkins that you can wash and use again. The cloth versions might be more expensive, but you don't have to chuck them away and replace them after every get together. Back to the beginning on the designs! That's it, you've seen them all now, therefore you're viewing the tablecloth from the original Outlander Party Set 1. I guess that I should have placed the tablecloth at the beginning, considering that all else lies upon it, but I figured that this was an item for serious Outlander party host(esse)s only. Most of us will make do with our laps or whatever is already in the airing cupboard. Again there is a tablecloth available for every party collection for Outlander fans already explored. Enjoy your party and don't forget my invitation! Coming soon - food for your Outlander premiere party! More Pieces for Outlander Premiere Parties! Since I do not get Starz, I was curious as to what Outlander is. I agree that if there is an interest held by a group this would make an interesting theme. Ember - Oh dear! I was going to do that, then got side-tracked by life! If I ever feel inclined to have an Outlander party I'll refer to your article, Jo, for advice. You've covered just about everything I reckon. Right now it's a St. Patrick's party I'm preparing for tomorrow with Fifty Shades of Green.